A few of my friends and members of my family know that I was born in Buenos Aires at the Sanatorio Anchorena on August 31, 1942 in spite that all my documents including my birth certificate state April 18, 1943. Legally I am almost a year younger. My mother told me my father forgot to register me. I don’t exactly buy that as the hospital would initiate that process. But my legal birthday has made it impossible to forget my Rosemary’s real birthday which is tomorrow. And because you can never deny a person’s request on their birthday (particularly when it is my wife) we went to Garden Works on Lougheed Highway (one of the best nurseries in the Lower Mainland) today. I took my umbrella. And of course, Rosemary bought plants that she says will go in a pot or pots. I purchased three miniature hostas (after all it is my legal birthday). In the nursery I found this sensational (a word very much used, nicely, by my friend Sean Rossiter, now gone) Camellia japonica ‘MonBella’. 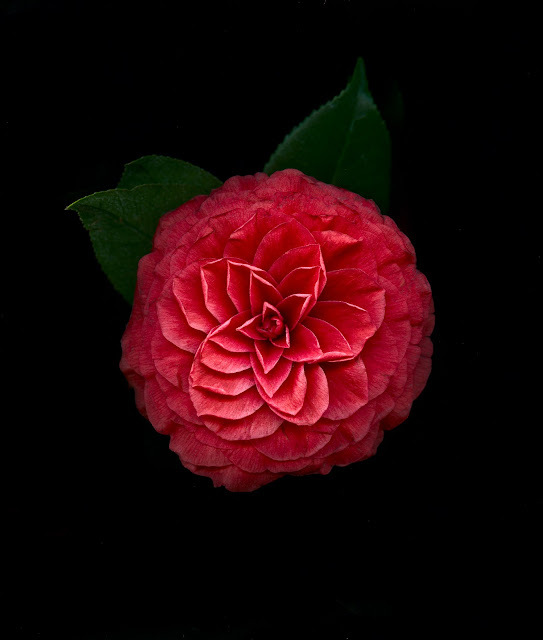 To me it looks like a complex old rose. Like most camellias it has no scent. Today Monday 15 April is sort of the first day where after at least a month of not writing blogs I decided I had enough peace of mind to remove this blogger’s block and write. Alas! Notre Dame Cathedral is in flames and that has not only engulfed the 12th century church, but the news and my peace of mind. In the age of the selfie, social media is awash with pictures of people standing in front of the cathedral. 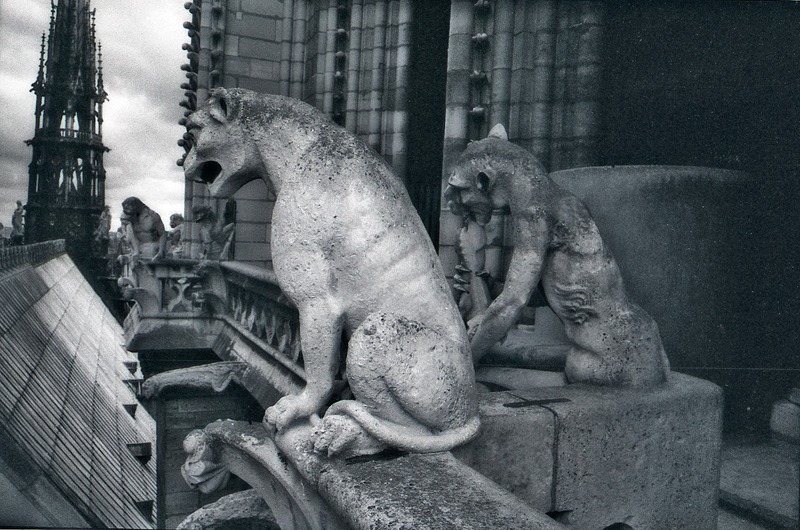 And a few artists/photographers/tourists have placed pictures of the famous gargoyles. In this age of physical isolation there is I believe an urge to belong, to feel part of something. As a freelancer in Vancouver for many years I longed for the idea of the office party. Somehow such a thing would make me feel part of an institution. I went to as many meetings and end-of-the-month magazine parties for freelancers in this desire I had to feel I belonged to something and somewhere. When some rock star (or actor) dies people, like ambulance chasers of yore are first to write something like, “I loved his music and it formed my upbringing.” I try not to succumb to this (understanding the ambulance chasers wanting to feel they belong by having "touched" in some way) but I do feel this yearning for stuff that has always been part of my life like Pontiacs, Kodak, TV sets with round corners, old friends and especially my family. 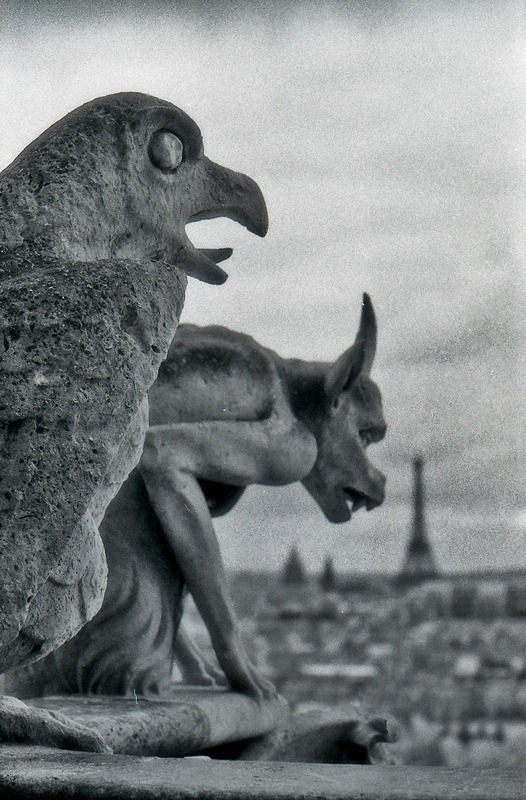 With Notre Dame burning one of the few stabilities (after all it is made of stone) in a world of instability, uncertainty and of questionable political and ethical morals such a monument is a beacon of stability. Its apparent loss will move all of us into mourning and the only apparent escape is to put a selfie by the church or to “publish” one of those terrible videos. For me the church instantly brings to mind the 1939 William Dieterle film, The Hunchback of Notre Dame with Charles Laughton and Maureen O’Hara as Esmeralda. The church itself is a hazy memory of being on it with my two daughters and wife around 1987 and my taking the inevitable photographs of the gargoyles. Today's event makes me realize of experiences from my past that I will never be able to repeat in person. And even worse that I could not share that experience with my granddaughters. I remember when my grandmother told me she had gone to a performance of Aida in New York City in the late 20s that featured elephants. She told me of a production of Ben Hur that had moats with galleys. Her voice and her account are vivid in my memory. Should I want to re-tell this to my Rebecca and Lauren there would be something lost.